Ring News 24Boxing News Breaking Boxing NewsWill the teacher Jeff Horn teach Gary Corcoran a boxing lesson? Jeff Horn will make the first defence of his WBO welterweight crown against unheralded Londoner Gary Corcoran on December 13. The former Aussie teacher is now very much a known name at 147 after defeating Manny Pacquiao and challenger Corcoran will need to have done his homework if he is to avoid a boxing lesson at the fists of ‘The Hornet’. After bettering ‘Pacman’, Horn inked a co-promotional deal with Bob Arum’s Top Rank outfit who will handle his moves alongside Duco Events, similarly to the deal Arum enjoys with New Zealand heavyweight Joseph Parker. Pacquiao, who has remarkably won world titles in eight divisions, has long since rubber stamped his name into the Hall of Fame ready for whenever he decides to hang up the gloves off the back of an excellent career. 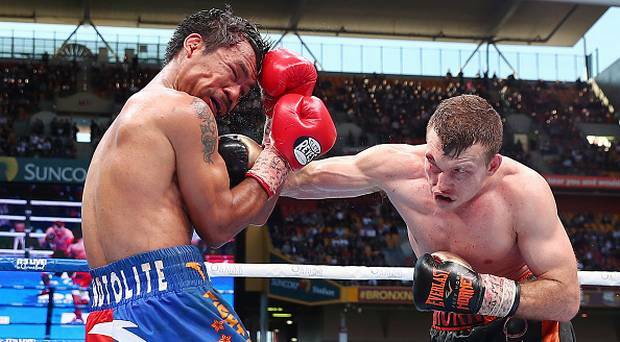 A rematch with Jeff Horn must surely be on his agenda as he attempts to wrestle back control of the welterweight class after conceding a unanimous decision to Horn earlier this year, by scores of 117-111, 115-113 and 115-113. Horn will not be concerning himself with Pacquaio at the moment, however, as he prepares for the unlikeliest of challengers in the form of Gary Corcoran. If Horn was making a random defence of his WBO crown having not beaten Pacquaio, or was fighting for a Commonwealth title or similar, then Corcoran would not be such a left-field opponent. Given that he is riding high off the back of defeating a modern day legend it was expected that a slightly more high profile first opponent would be found. Saying that, Horn is clearly looking to put a few dollars in the bank before he faces the inevitability of having his prized possession ripped away by the one of the division’s sharks. 27-year-old Corcoran is 17-1 with seven knockouts on a slate built exclusively from British domestic level scraps. After beating the usual string of journeymen, Corcoran stepped up twice in 2015, taking the unbeaten records of Rick Godding and then Rick Skelton. In early 2016 a win over decent British operator Danny Butler was for the vacant WBO Inter-Continental super welterweight title which no doubt did wonders for his credentials with the WBO rankings system. Later in the year Wales’ Liam Williams stopped Corcoran in a bad-tempered British title affair that doubled as Gary’s biggest test to date. He rebounded with a narrow split decision win over unbeaten, but inactive, Larry Ekundayo, capturing the vacant WBO Inter-Continental welterweight crown in the process. This, again, would be a favourable step in the eyes of the WBO. Corcoran currently enjoys a lofty ranking spot (just sitting at number 10) so was naturally delighted to be plucked out of obscurity and thrust into position for a welcome payday. Frank Warren also revealed that one of his fighters, Bradley Skeete, was under consideration for the crack at Horn, but the Aussie’s team turned down the WBO number three ranked fighter in favour of his UK compatriot and Warren stablemate Corcoran. Corcoran is a tough customer with good wins at a certain level, but will struggle to match the workrate and intensity of Horn who I expect will be working his challenger over by the eighth or ninth round when the referee intervenes. Victory would surely push Horn back in to a rematch with Pacquiao, either in Australia or over in the Philippines, or in to a fight with a welterweight rival. Keith Thurman currently holds the WBC and WBA straps and Errol Spence Jnr the IBF portion. The likes of Lucas Matthysse, Shawn Porter and Danny Garcia are also hanging around the upper echelons of the 147lbs division, but all three are currently signed to rival promoters which would make a matchup with Horn politically problematic.